Just checking in to say Hello and share a cute little place I went shopping. I spent the day with these two sweeties. My daughter Jen and granddaughter Charlotte. This wonderful place was called Avant Gardens and is now called the Shops on 71. It is three wonderful vendors that rent this place and sell the most amazing things. 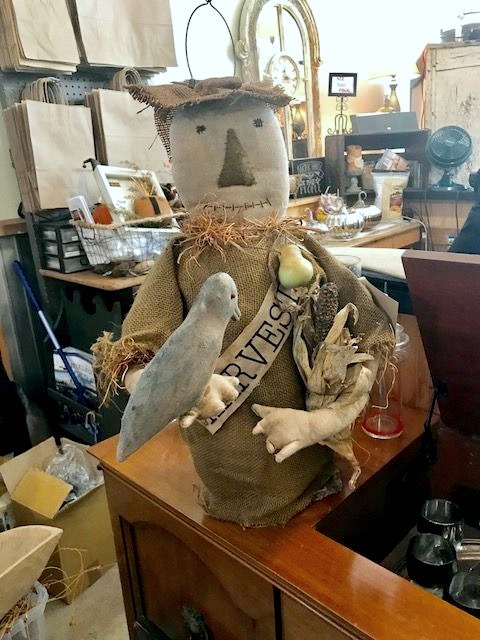 I was here the other day with a good friend and she spied something she just loved so my daughter and I took a ride back to pick up this wonderful gift for my friends birthday. Now these next three pictures are for you Texas gals and southwest girls. 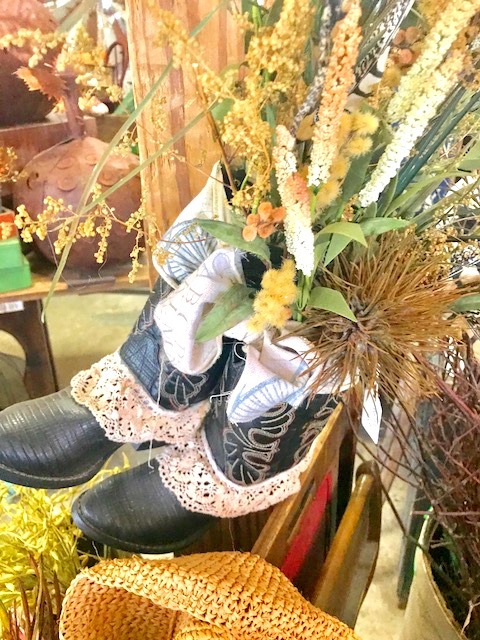 One of the vendors takes cowboy boots and stuffs them full of wonderful fall decor for front door decor. Loved these. Look at these sweet chippy hangers. The cloche on the left my daughter bought to put on her dining table. She will add fall decor under it and make it pretty. 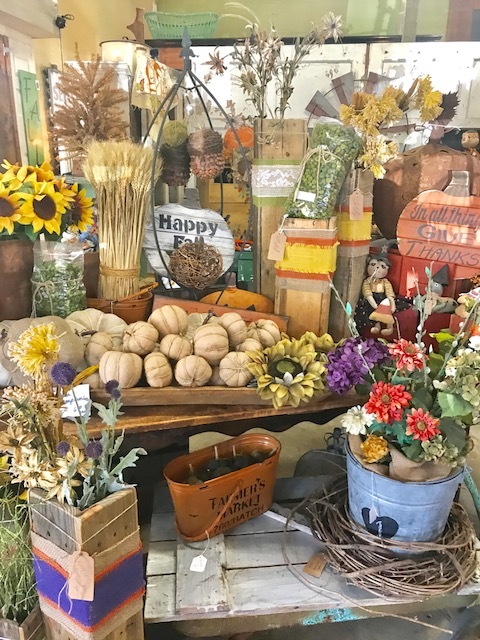 All the vendors are starting to bring out their fall decor. 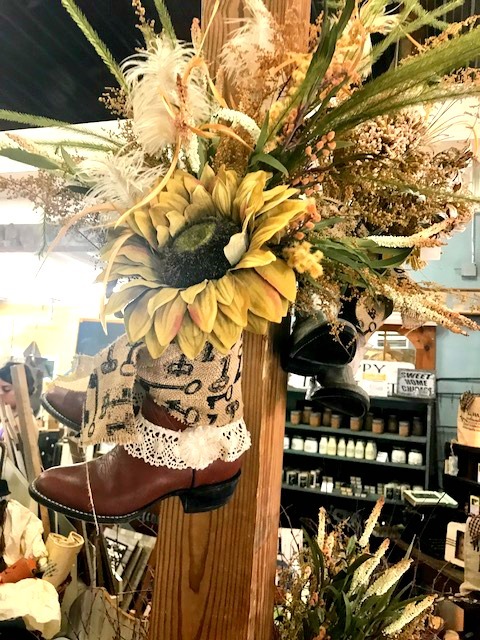 I loved the faux fall flowers this vendor has made into many cute centerpieces. Loved this guy he just made me smile. One of the vendors had a whole lot of "Kris" things. White, chippy shabbies galore!!!! 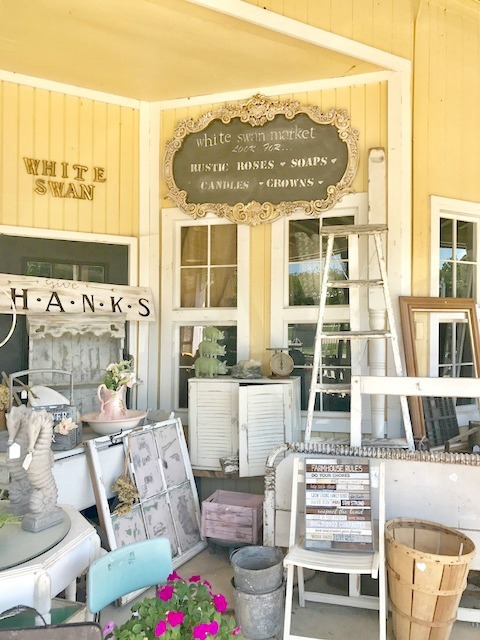 Swooning over these white corbels. 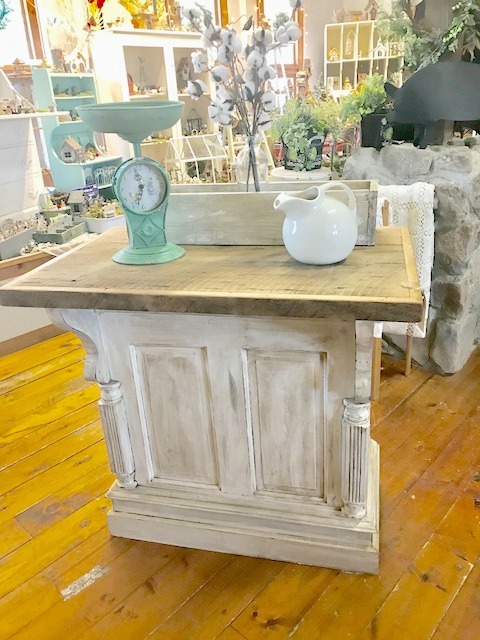 Loved this sweet little kitchen island. 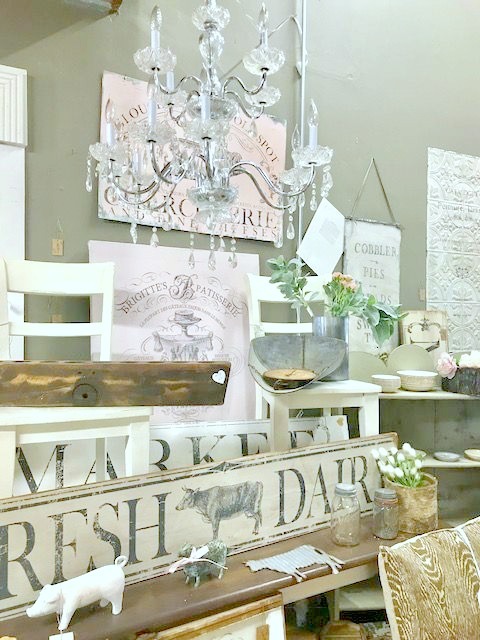 Lots and lots of farmhouse decor. Look at this cute lamp!!!! This would be so cute in a laundry room. I of course needed one of these sweet shirts! I am thinking about this lovely piece. This armoire has hanging on one side and drawers on the other. I am thinking of getting this and putting it in our bedroom or the guest room of the new house. Our 1949 cottage we bought does not have big closets so this would give us some more wardrobe storage space. Of course it will be painted white!!!! It has really cute feet!!! The price was really good on this piece and they are having a grand opening sale on Saturday so I think it will be even less. Progress is continuing on the new house. Hoping the basement stuff will be done this week and then the garage all done by the weekend. Then we can start to think about setting up our move in. Ahhh a girl can dream!!! Have a lovely rest of the week and wonderful weekend. Ahh Kris, this looks like my kind of store! I must argue with you on the cowgirl boots though, that they are for Texas or Southwest girls... 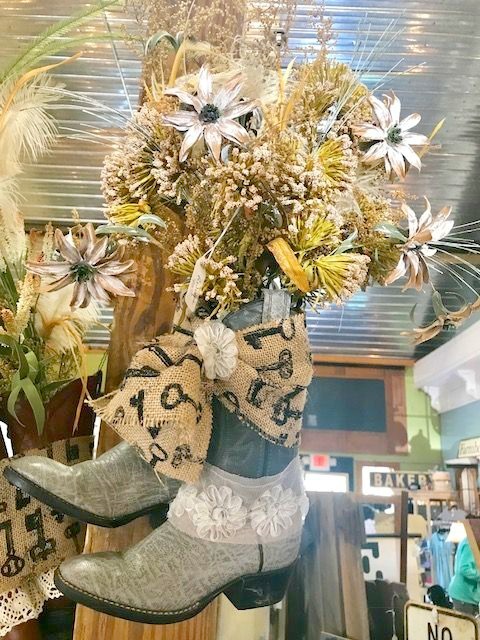 I am from NC and here we have tons of people who wear boots and that decor would be a hit around here too. :) I love the cloche your daughter purchased, I am envisioning all of the pretty ways you could use it to decorate with! I bet you would love these boots! They were cute for anyone!!! Happy Friday and have a great weekend. How fun, so much cute stuff and a day shopping with your daughter and grand are always the best kind of days. Love that armoire too, I am sure you need that one. This looks like a wonderful place to shop! That armoire is beautiful. I know you are so ready to move into your sweet cottage. Aww!! who's is that cutie pie.. you daughter is so beautiful and jolly.. XOXO..
What a fabulous little shop. I could spend hours in there. I enjoyed browsing with you!!! I want to see what your daughter does with that cloche on her dining table. She is so pretty! She has movie star eyes! Your granddaughter is a cutie!!! Oh how fun this store is, so many lovely items. I would have gone crazy in there LOL. Love the armoire and it will look so good painted white. I know that you are so excited to move in and soon you will be in there, can hardly wait to see what you do. PS Charlotte and mom are so pretty. FUN!! I saw several items I liked. I love your idea with the armoire. Oh my gosh, I love that laundry room lamp! I also loved the mint green scale. I went to a fun shop today too but didn't take pictures. There's an awful lot of fun stuff out there. Oh, what fun! Loving all thise white goodies!!! I could spend hours in there. Now this is my kind of day....and I've spent many of them this summer, perusing great antique shoppes. It's over for me now; today is my last day of summer vacation and how will I spend it? I HAVE TO GO TO THE DENTIST!!!!!!! The kids don't go back to school until Tuesday, September 5. But next week, we teachers have to get back for meetings and preparation. The good part is however, that on my way home from school, there are lots of antique shoppes to stop into!!!!!! Now you're talking. I know when you're shopping, it's decor time! Love the old wardrobe. It'll look great in your home, and even be period-appropriate! Jen's wire cloche is really cute too. Hey, those boots are a two-fer - you get door decor and door knockers, both for one price, lol. Love the patina on the armoire! What a cutie charlottes is :). The armoire is very pretty! I can just see it in your home painted white. Looks like a very fun place to browse and shop. That's a sweet picture of Jen and Charlotte! What a great place to shop, Kris! There are so many wonderful signs and I also love the cows and the mint colored scales. The big bag is fantastic too. The armoire would be wonderful for your new home. Hi Sweetie, I'm glad that you are taking time for yourself. You little one has really grown! She is so darling. I love the shop you went to what a fun place so much inspiration. I think that wardrobe would be so beautiful in your sweet cottage. I just know that you new home is going to be amazing. Have a lovely weekend. Hi Kris! What a beautiful shop! So many things caught my eye in your photos -I can't imagine what it's like in person! I have a metal cloche like the one your daughter bought! Love that island and cute little desk and that old washer lamp is fabulous! Those big white corbels need a place in your new cottage! Diggin the t-shirt and the overnight bag and YES! The wardrobe painted white would make for incredible and charming extra storage! I hope you can get it! So glad y'all had a fun time and that your construction is almost complete! Have a great weekend! Hugs! Aw, look how big Charlotte has gotten! Isn't she a cutie! What a cool, cool place to shop! Definitely get the armoire! It would be perfect for extra storage! They had some great items! I always enjoy exploring via blogs places I cannot go to. What a cute store, but even cuter girls! You are a lucky lady! What a darling shop. I would have been so tempted to buy, buy, buy. I love that cabinet. So cute. 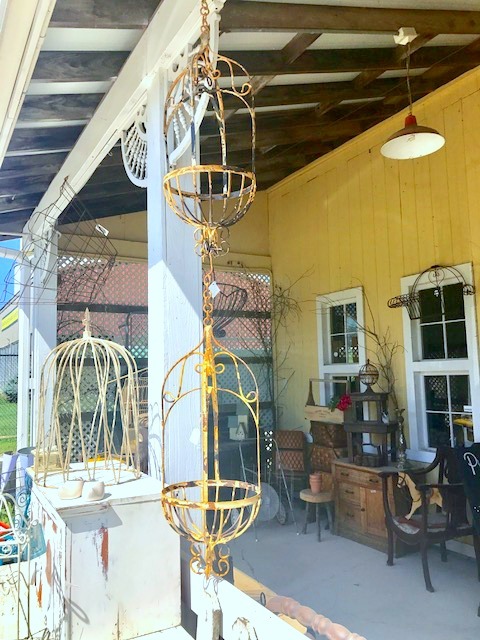 As for all the great Junk for Junk Chic Cottage? I too love the corals, and would have had to has snagged up that armoire. So you have my vote. I can wait to see your move in. Looks like a fun place to shop with your favorite people! So happy that you had a wonderful time with your sweet girls! Yes, that t-shire was made for you!!! The scale on the kitchen island really caught my eye. What a nice place to shop! That armoire would be lovely once Kris-ed with white paint! I love the corbels too, and that pale green scales on the island you liked is a dreamy color and shape. You're sure making me crave some shopping time with granddaughters! I pray that all goes well with the final countdown to move in time! Kris, This is such a cute shop and I know you had a fun day with your girls. That little lamp is adorable for a laundry room. What a fun shop! I hope you got the armoire to do your magic on. Your daughter really resembles Terry, but she has the sweet sparkle in her eyes that reminds me if you! Charlotte is so cute. Is this the daughter that also has Abby? Where the heck is this place??? I want to go! I saw a lot of cute things I'd love. The T shirt is you, and I hope you snag the armoire! Hello Kris, oh what a wonderful store and I just love those floral arrangements in the boots. There is so much to look at there. I wish you a lot of luck with the house and hope you can get settled in there soon. Enjoy the weekend. Love the "Kris" booth myself. Your taste is mine! I would love, love to decorate with the chippy cloche. Sooo pretty. Thanks for sharing. These are great! 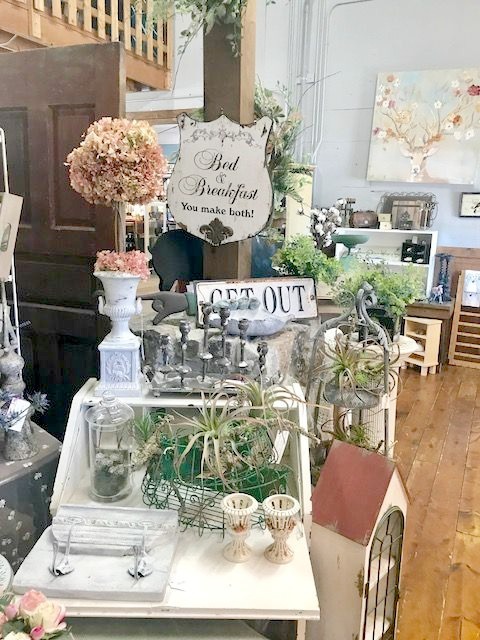 You have the best shops around you. Oh my gosh what a fun store!! I could spend hours nosying around in there!! There is so much to look at there. I wish you a lot of luck with the house and hope you can get settled in there soon. Enjoy the weekend. More great shopping! You are on a roll. Wish I could shop with you in person! More Progress. New Floors and A New Front Door.